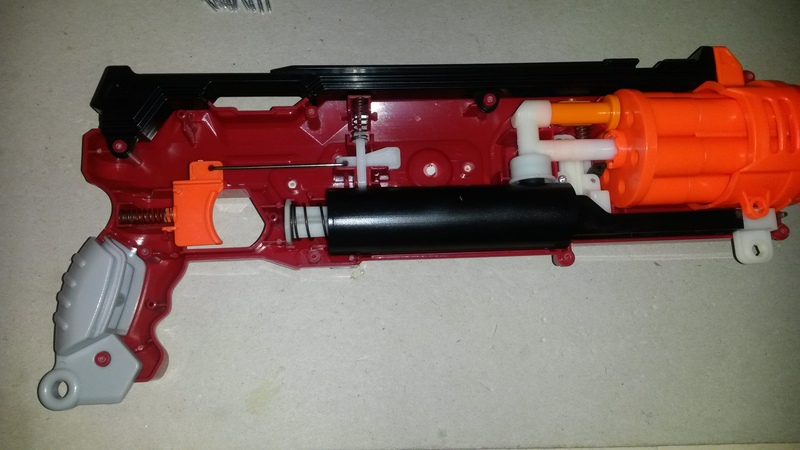 An unexceptional but fairly solid blaster. 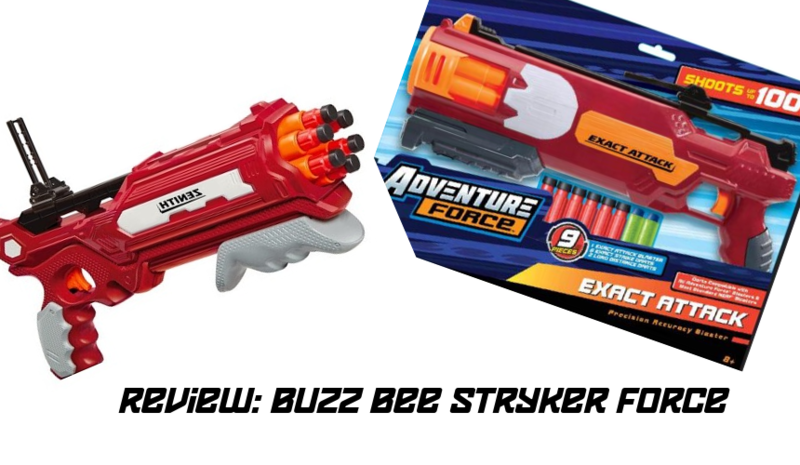 The Stryker Force is the smallest and simplest in Buzz Bee’s latest line of releases, with their new dart designs being one of the main features. 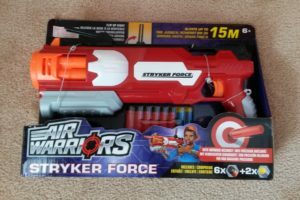 The Stryker Force is somewhat reminiscent of Buzz Bee’s older Air Max 6, though of course while that blaster used an air tank, this is a conventional springer. I will be reviewing Buzz Bee’s new darts in a separate post. 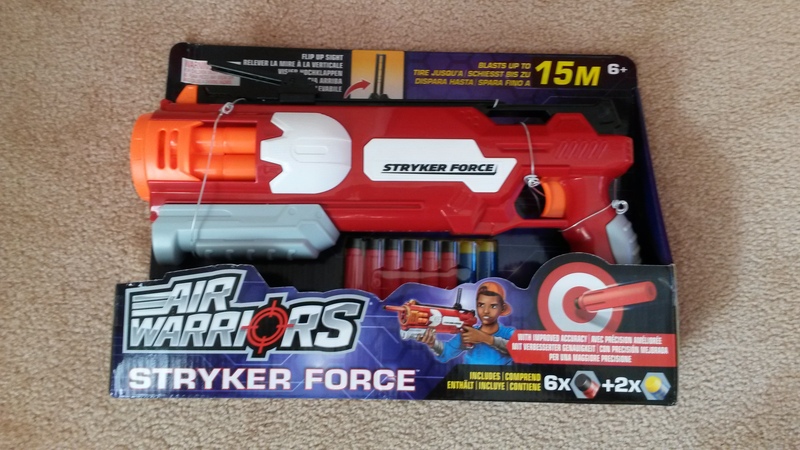 Note that the Stryker Force is in fact not a direct recolour of the Zenith, but is still physically similar. 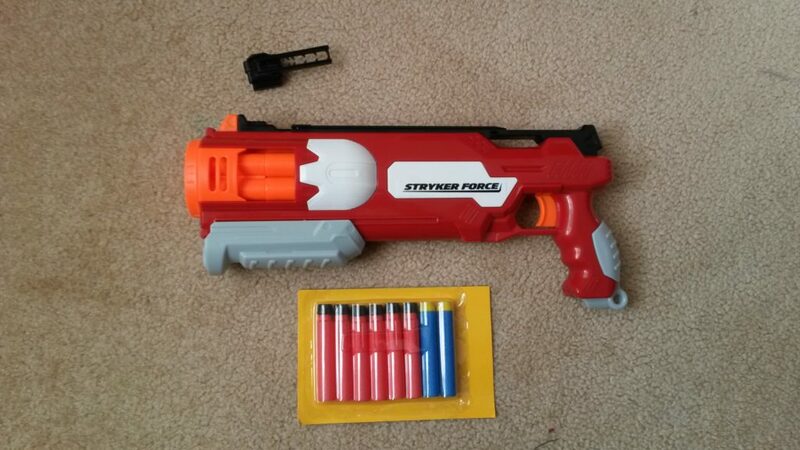 Interestingly, the Stryker Force uses the same shell as the Adventure Force Exact Attack found at Walmart. I believe the Stryker Force is simply the Zenith’s replacement in certain regions. 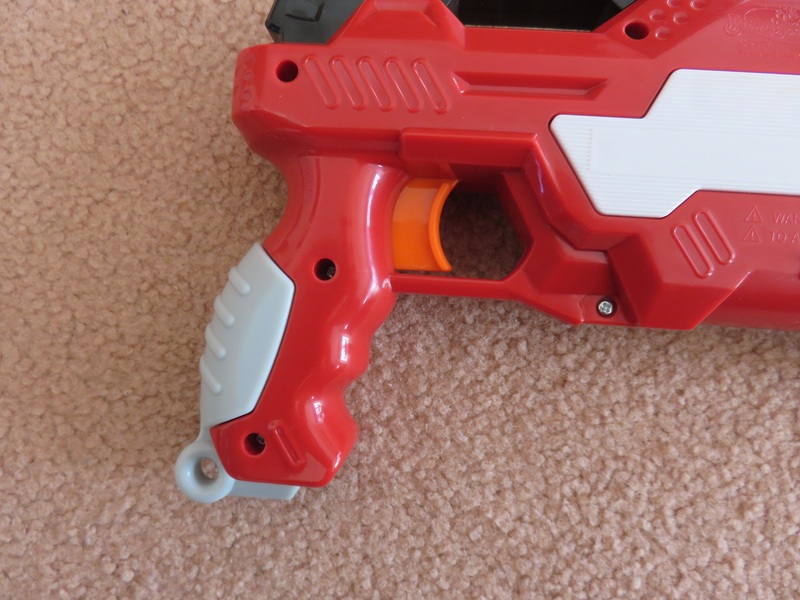 Disclaimer: This blaster was sent to me by Buzz Bee Toys for review. 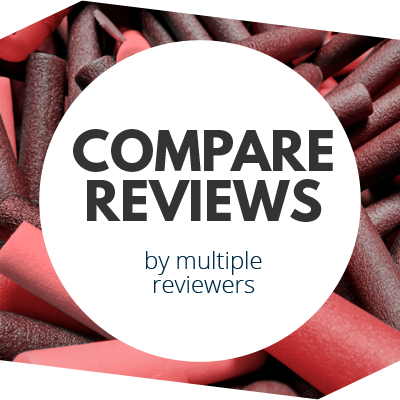 I will do my best to ensure that the review remains as objective and unbiased as possible. 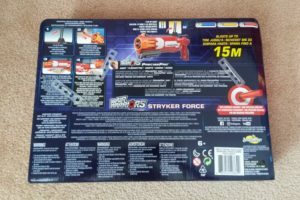 Everything in the Stryker Force box. 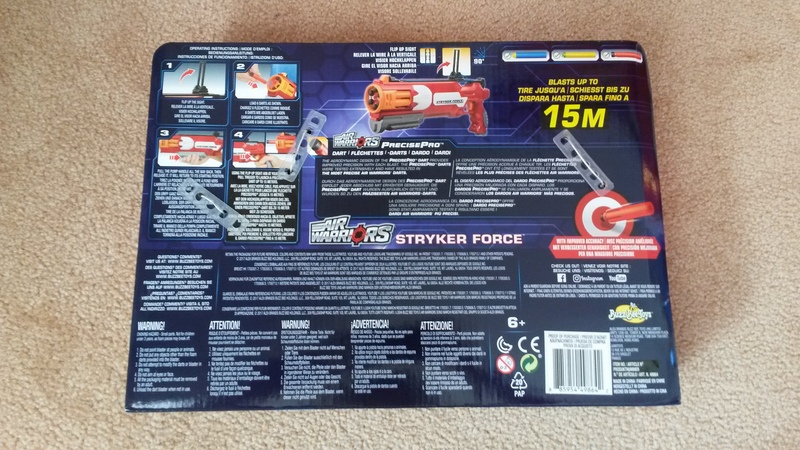 Note that the Stryker Force includes 6 PrecisePro (PP) darts, and 2 Long Distance (LD) darts. 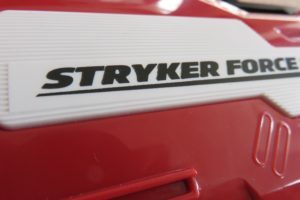 Front of the Stryker Force box. 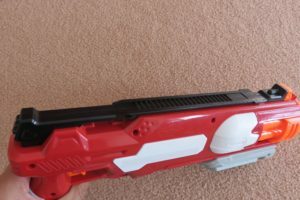 Left side of the blaster. 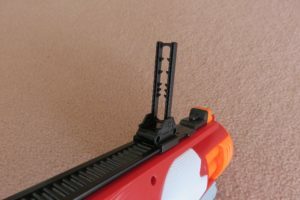 A better look at the tactical rail on the top. 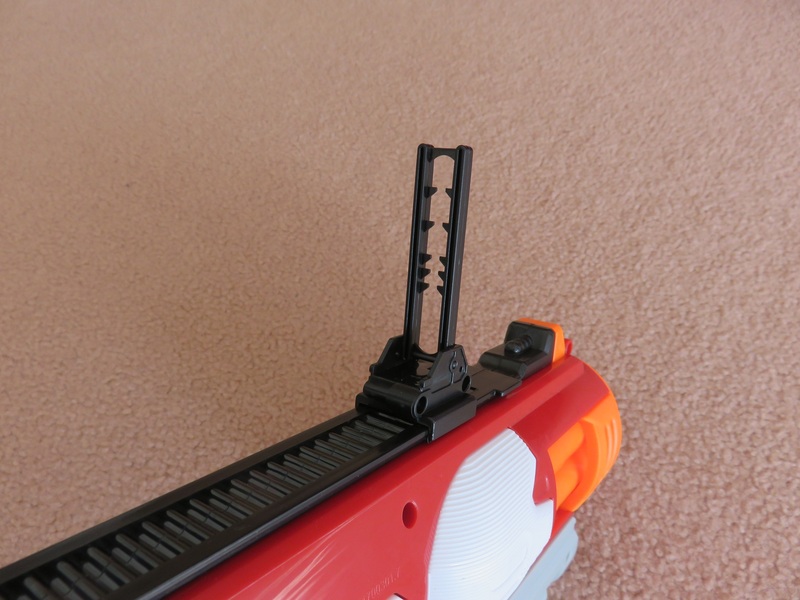 Heatseeking scope attached to the tac rail. Sling point on the handle. Close up of the painted (not stickered!) name. Close up of one of the shell segments. 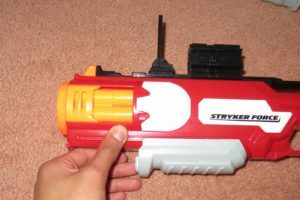 The Stryker Force is a relatively large and bulky 6 dart revolver. 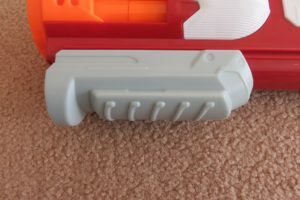 It has a single Buzz Bee tactical rail across the top, which appears to be a new standard design. 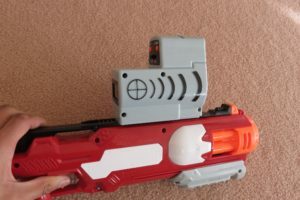 It for instance fits the Thermal Hunter/Zenith’s Heatseeking Scope without issue. The balster has a single sling point, on the bottom of the handle. 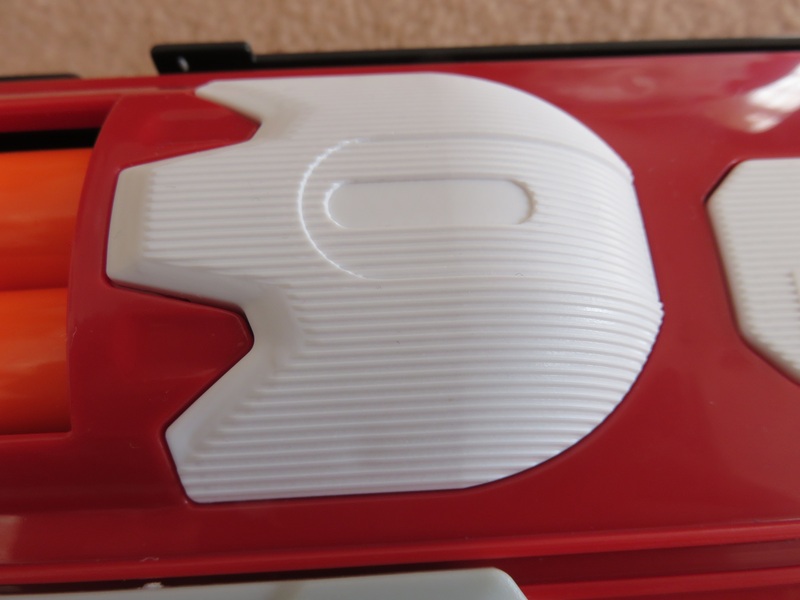 Of note with the newest Buzz Bee releases is their improved overall quality. 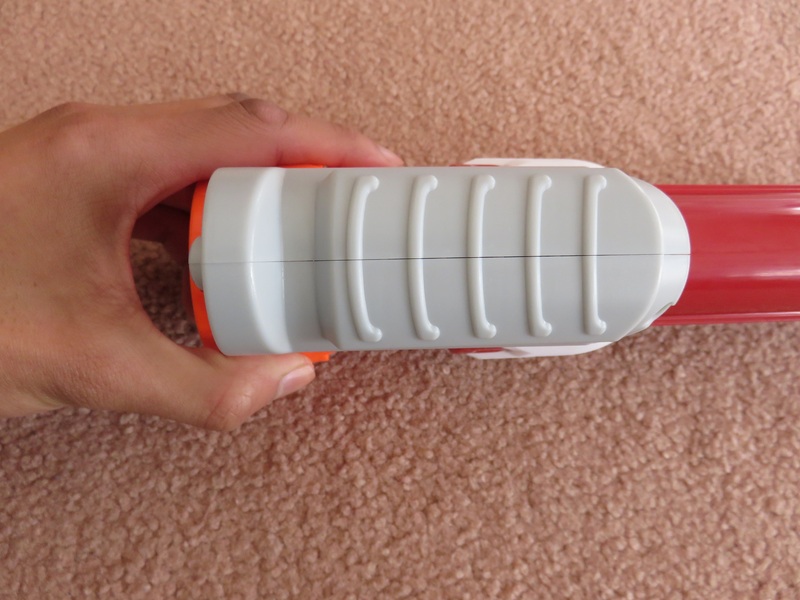 The plastics used are a significant improved compared to older Buzz Bee blasters, and the detailing is a step above as well. 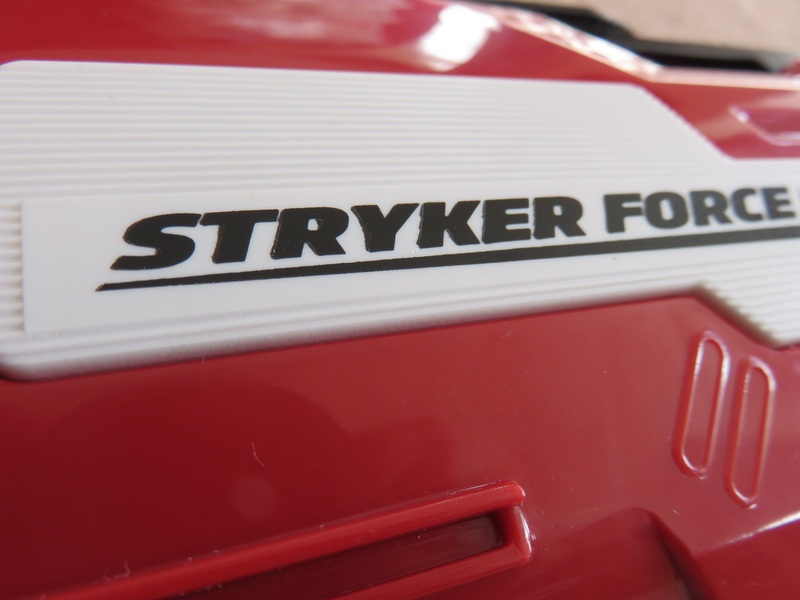 The Stryker Force has its name printed/painted on rather than just being a sticker. 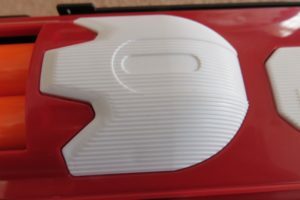 Many of the shell components feature intricate detailing not found on older designs. Close up of the handle. Trigger pulled all the way. 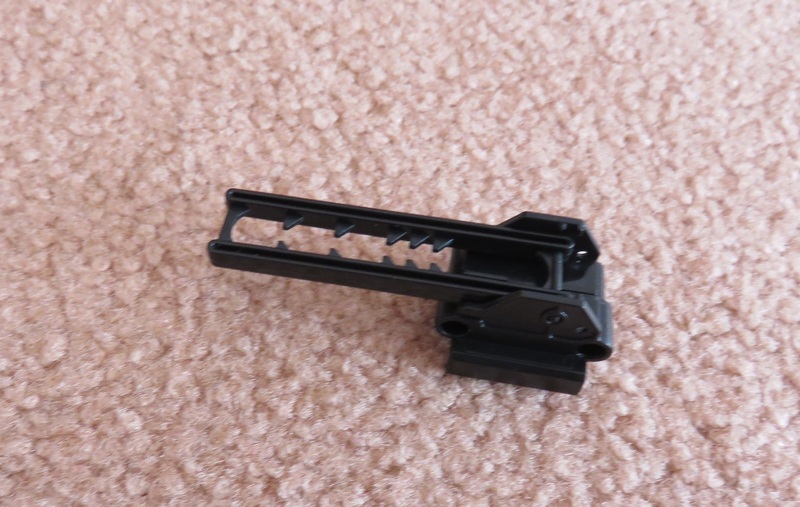 I personally find the Stryker Force’s handle to be awkwardly uncomfortable. 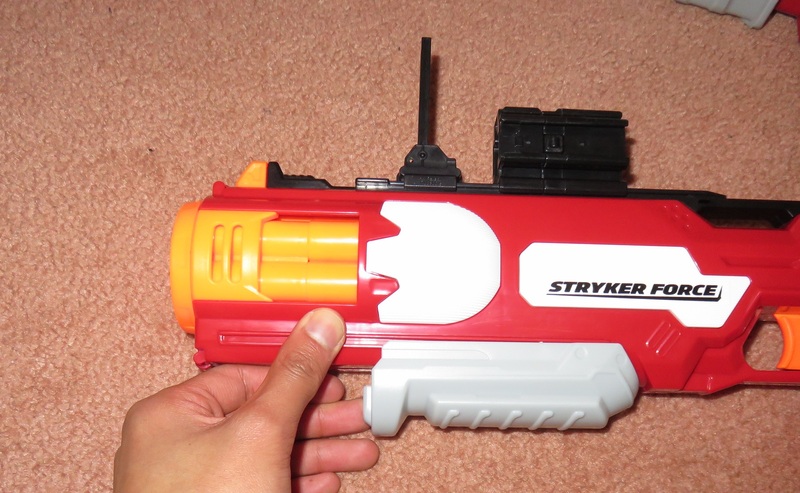 It is very small, especially in relation to the rest of the blaster. 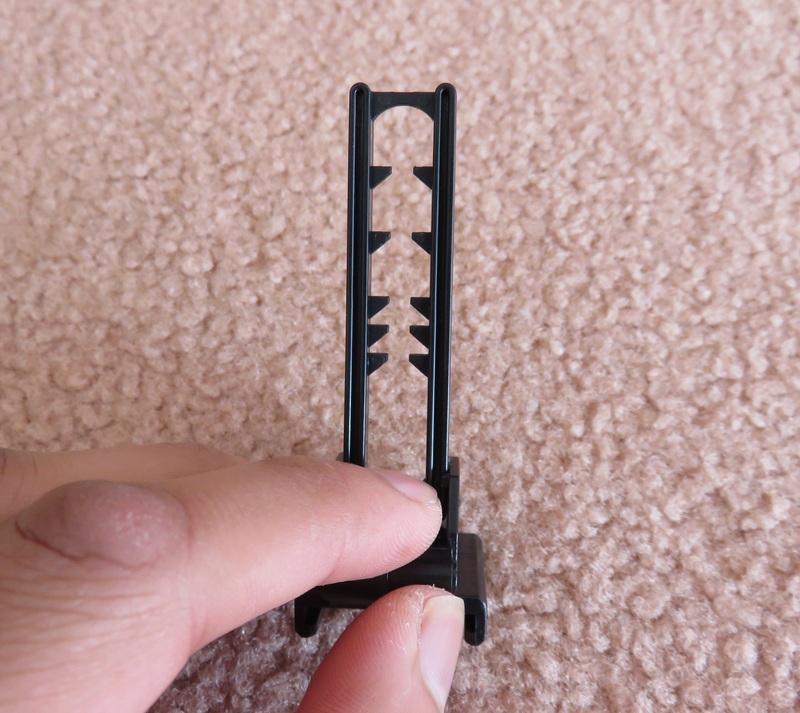 In particular, I find the the slight forward hook of the bottom of the handle to be especially uncomfortable. 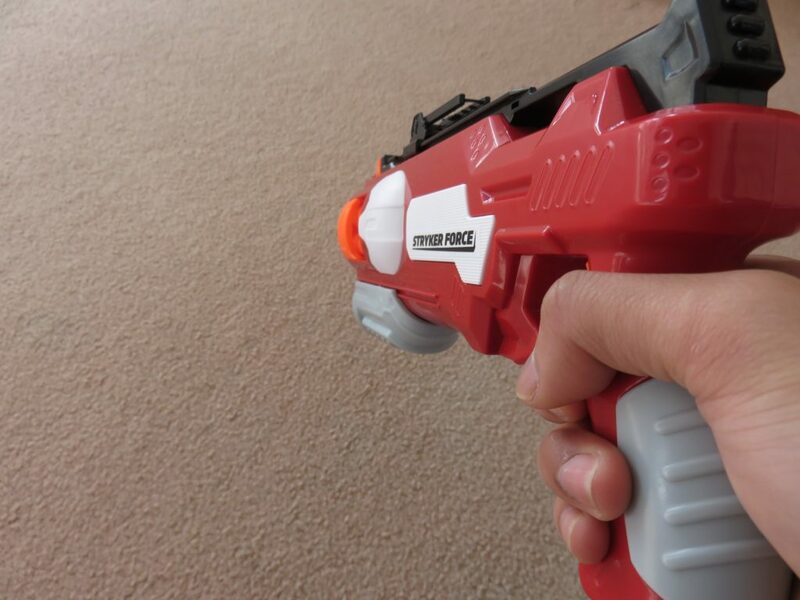 I personally am not a fan of the trigger pull either. I have found that a slower trigger pull with my right hand often has issue firing the blaster, only firing at the very end of the pull. 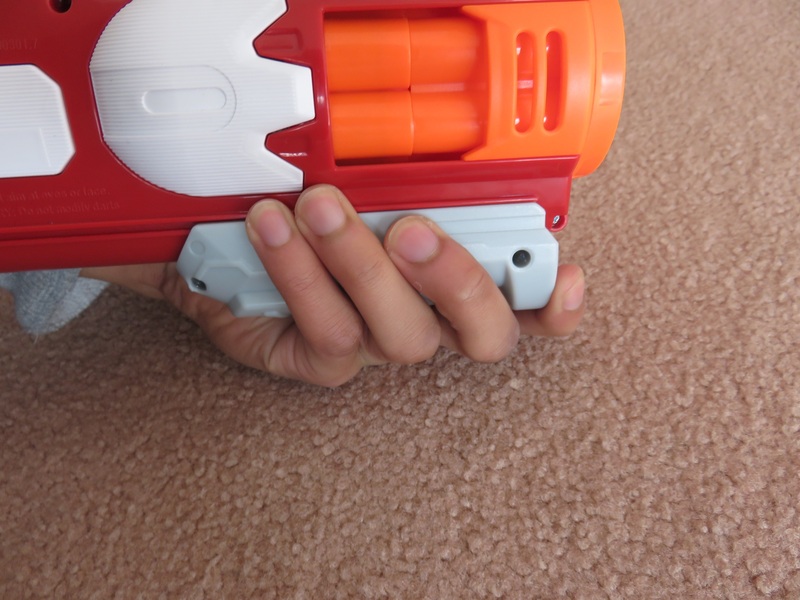 This issue occurs less with my left hand, or with a faster trigger pull. Additionally, I personally feel that the trigger pull moves a little too close to my hand, and a full trigger pull can at times feel a little uncomfortable. 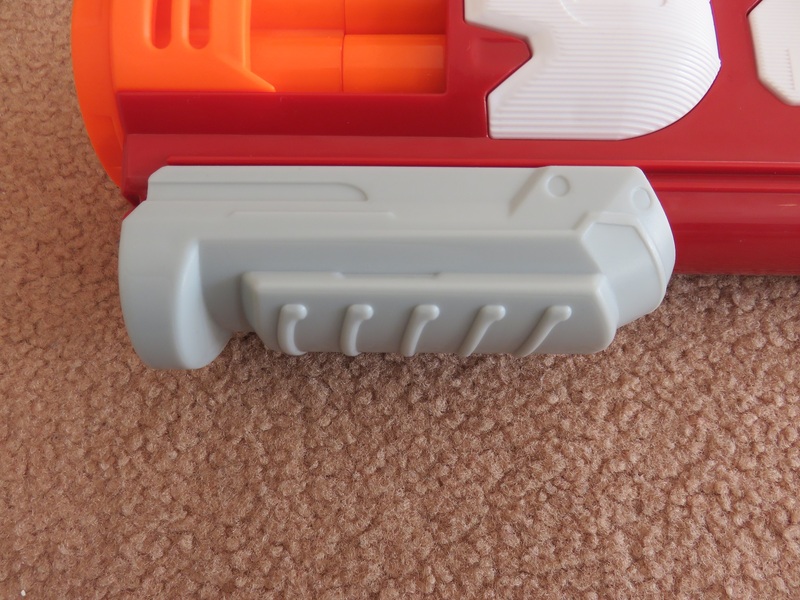 Close up of the pump grip. 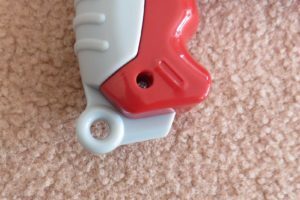 On the other hand, I rather like the pump grip. 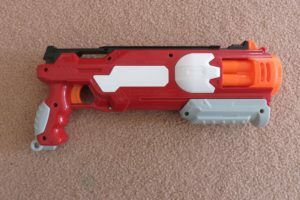 It is a reasonable size for the blaster, and in particular I like the front end as it offers a good surface to pull on. The pump is spring loaded and will return to rest position on its own once primed. Close up of the cylinder. Direct frontal view of the barrels. 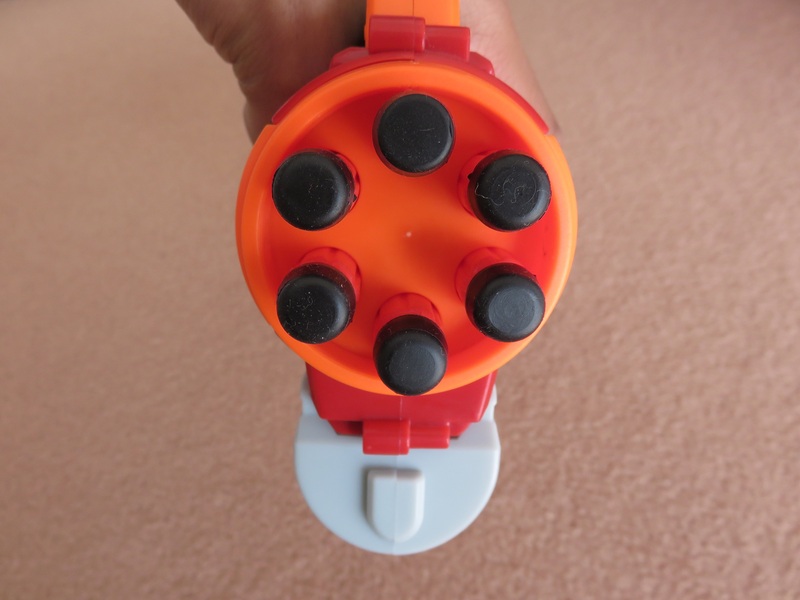 Showing how far the darts protrude from the muzzle. With one dart fired and the next rotated into firing position. 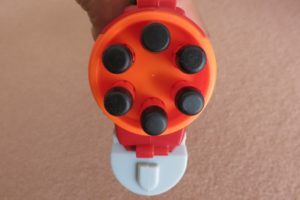 The Stryker Force’s cylinder is a little unusual. 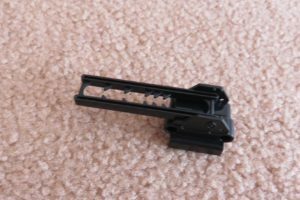 It is secured from in front by the rim of the muzzle, This leaves it completely exposed from in front, allowing for especially easy reloading with no obstructions from in front. When loaded up, the darts protrude quite far out of the cylinder, a little past the edge of the muzzle. I find the barrels of the cylinder to be a little tight for stock power, at least for the Aus-spec model I received. 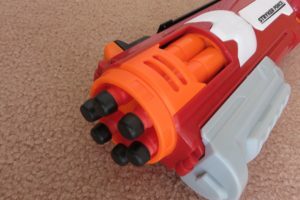 It can have trouble firing particularly thick darts, sometimes completely failing to fire them. 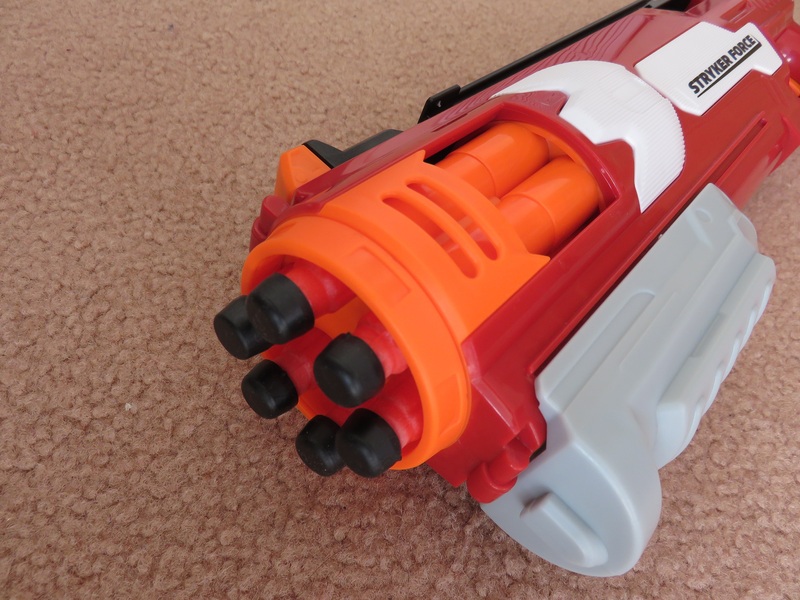 The blaster fires from the top barrel. 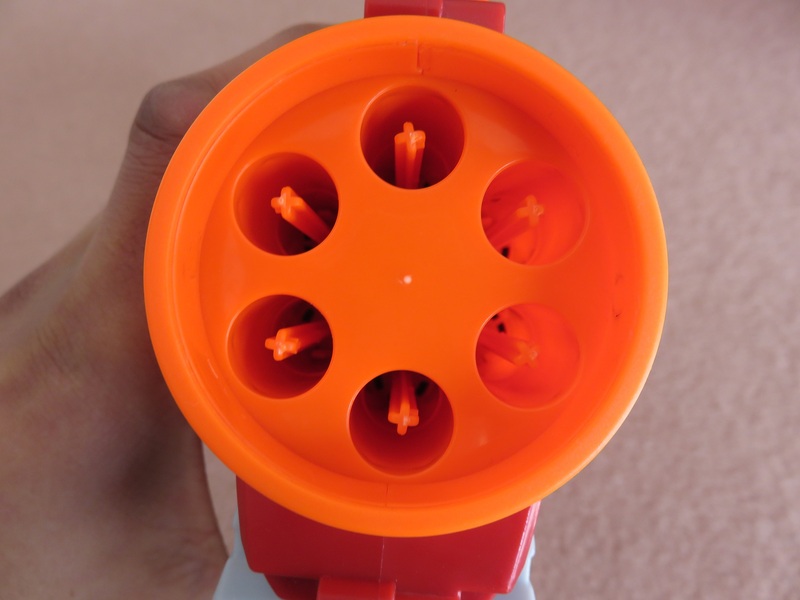 The cylinder rotates clockwise from the user’s perspective upon priming. 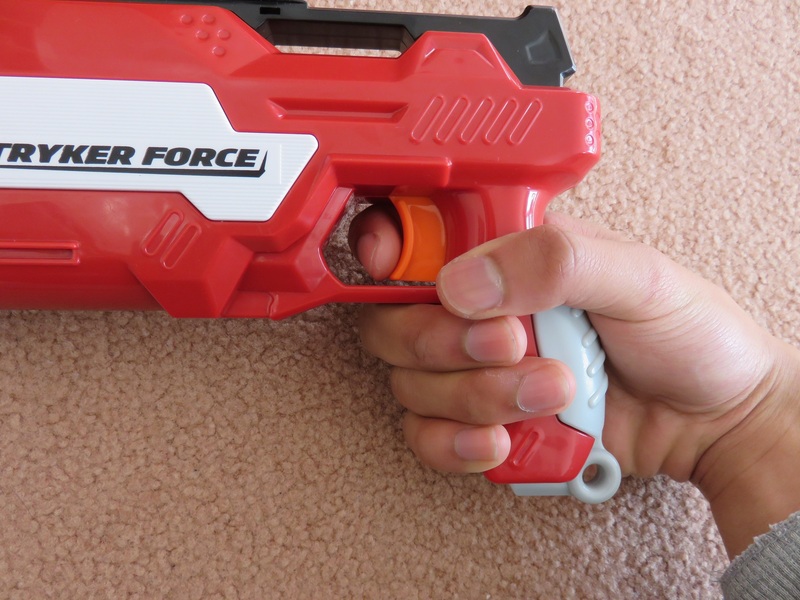 It can be repeatedly rotated by priming the blaster repeatedly without firing. Next to a Sweet Revenge. The Stryker Force is actually quite a large blaster for a basic 6 dart revolver. 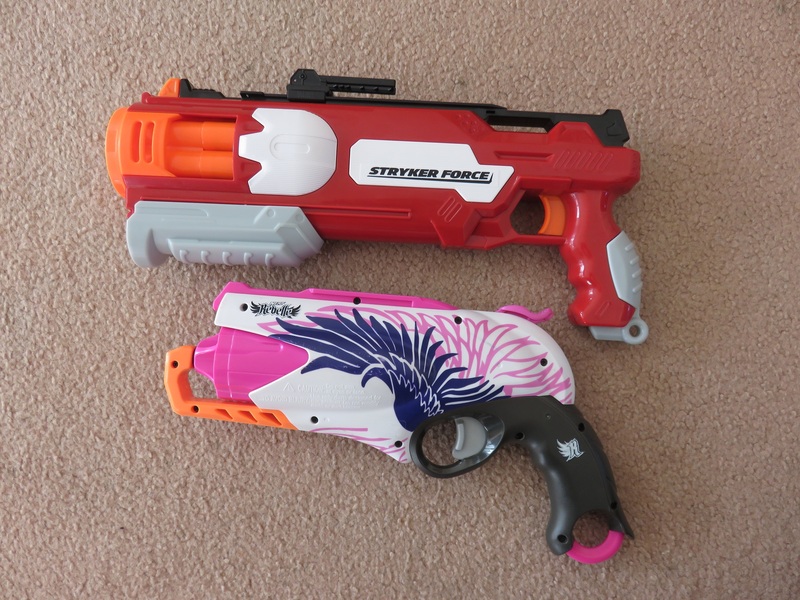 It is noticeably longer than comparable revolvers, such as the Strongarm/Disruptor and Sweet Revenge (as pictured). Furthermore, since the bulk of its weight is towards the front, it ends up being a rather front-heavy and unwieldy. As a pump action blaster, this is significantly mitigated while in use, however I still consider the Stryker Force’s unusual size to be a slight detriment to its usability. 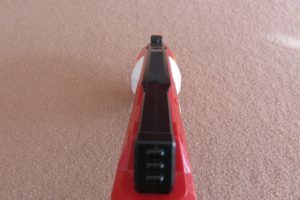 The included flip up sight. 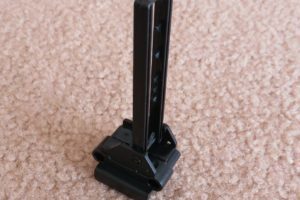 Sight attached to the tac rail. 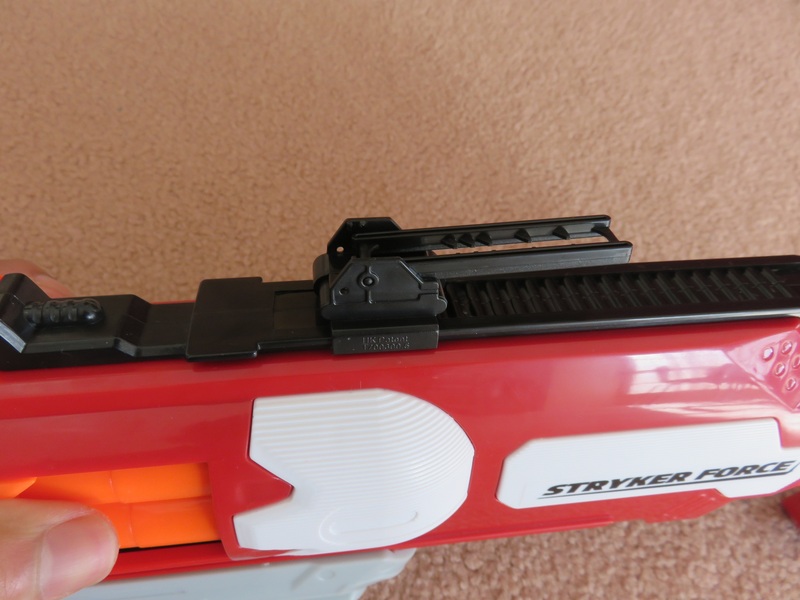 The Stryker Force includes a small flip up sight that attaches to Buzz Bee’s tactical rails. 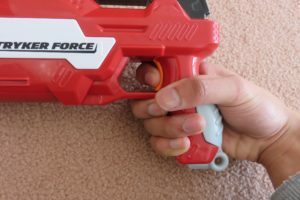 It features a number of notches like a “leaf” sight, to try and help the user angle the blaster appropriately for the desired range. 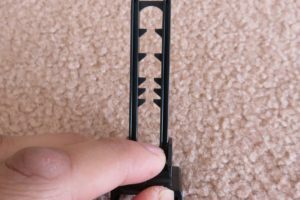 The sight flips up and down easily, and attaches smoothly on tactical rails. 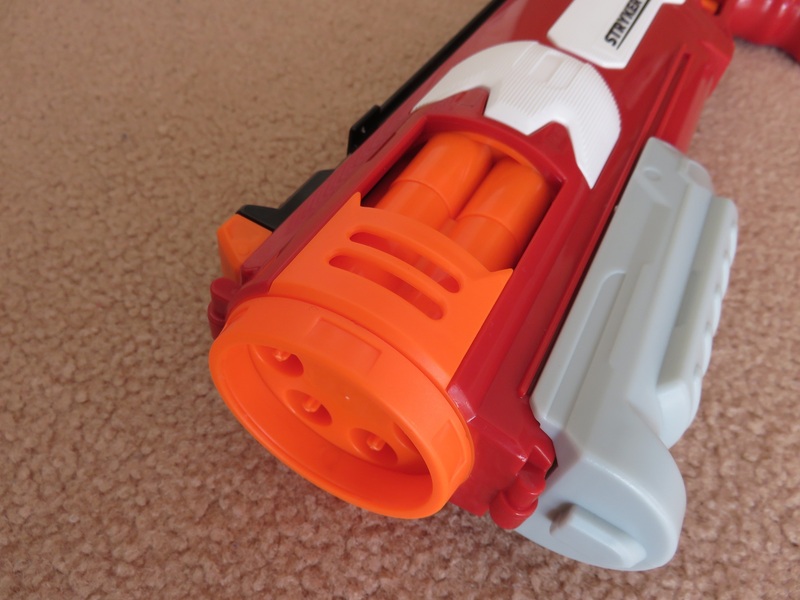 Like with most sights for stock blasters though, it isn’t likely to be much use in combat. 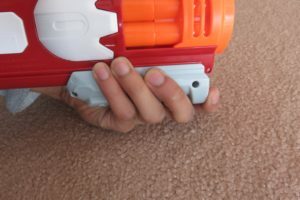 First person view of the Stryker Force. Chrono data of the 15m Stryker Force can be found in this Google Sheets document. 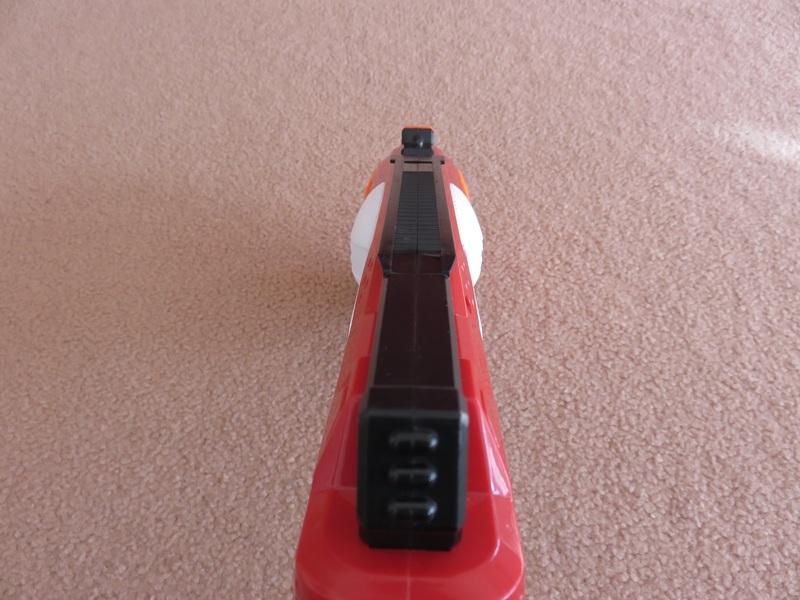 This model achieves around 50fps muzzle velocity with both PrecisePro and Long Distance darts. 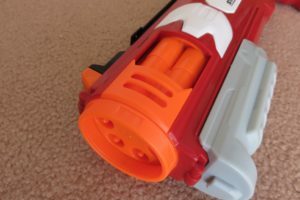 This puts it roughly on par with previous Buzz Bee blasters of the same spec, as well as a typical grey trigger Nerf blaster. This translates to roughly 8-9 metre ranges with PP darts, and 7-10 metres with LD darts. Accuracy depends primarily on the darts used. As their name suggests, PrecisePro darts are particularly accurate and consistent, and fly very true out of the blaster. LD darts are far less consistent, veering all over the place, much like Elites. Rate of fire is not exceptional, but is far from poor. Without slam fire, the Stryker Force is limited to a maximum rate of fire of around 3 darts per second. 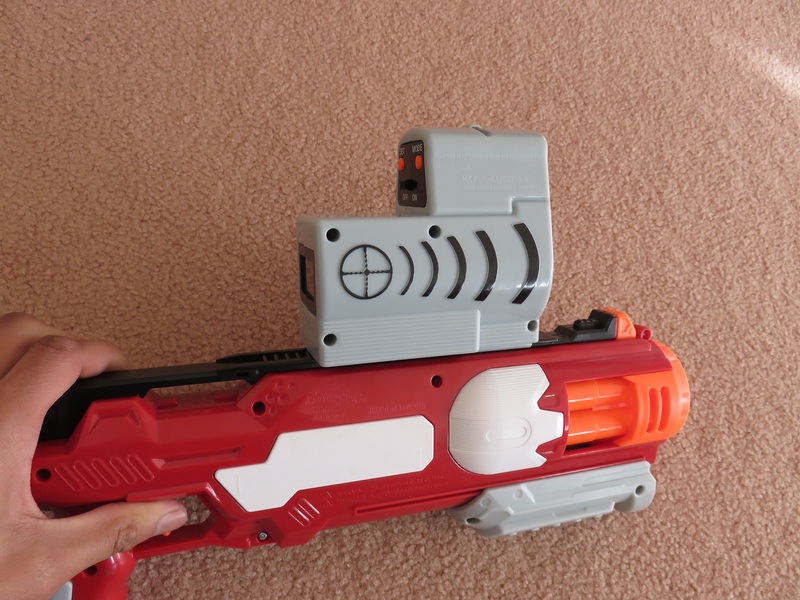 While by no means bad, it is easily outclassed by slam-fire capable competitors such as the Strongarm and Disruptor. The Stryker Force serves a similar role to comparable small revolvers, such as Nerf’s Elite Strongarm or Disruptor. 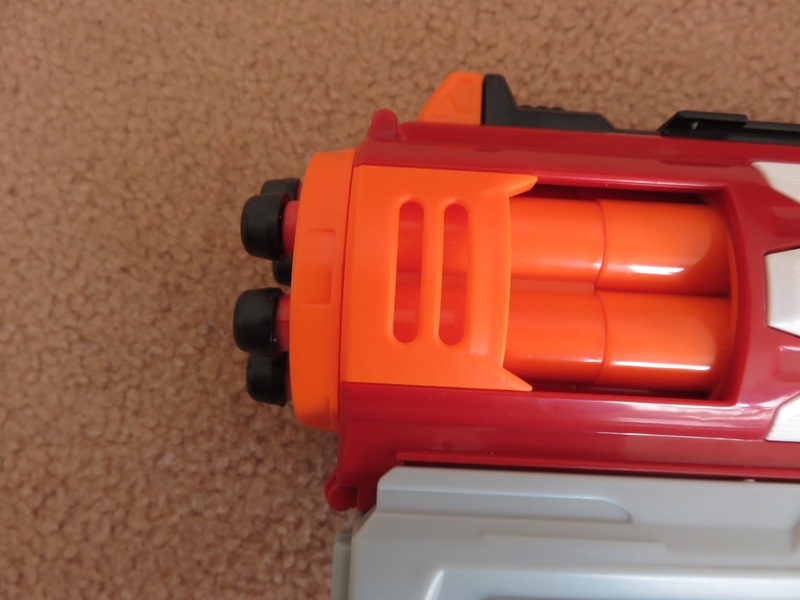 It is a relatively compact blaster that is easily reloaded on-the-move thanks to its exposed barrels. 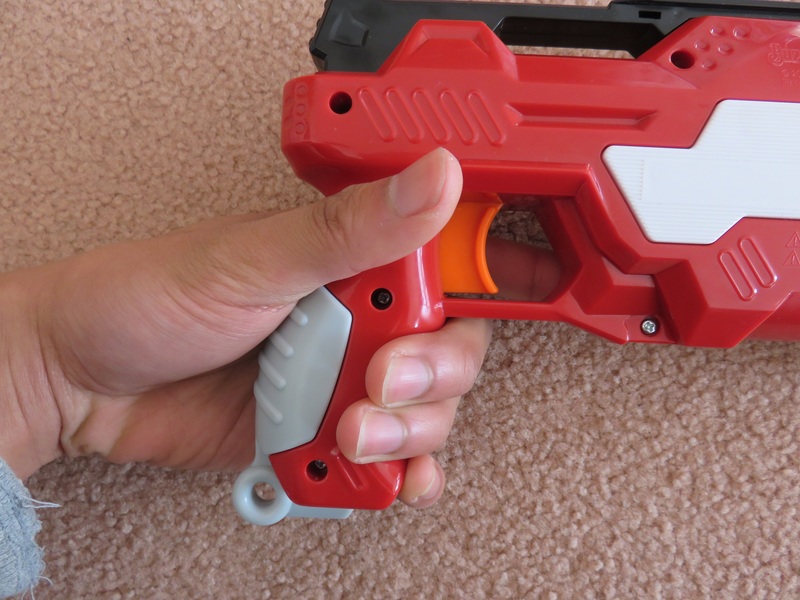 Compared to the aforementioned blasters however, it is a lot larger and bulkier, making it less ideal for holstering or carrying around. 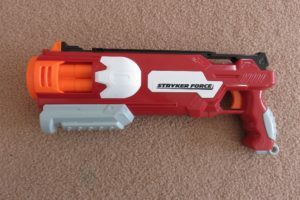 While the US-spec Zenith is notably powerful, the toned-down Stryker Force unfortunately has no such advantage, and in my opinion, besides the ease of reloading, has no practical advantage over most other comparable blasters. 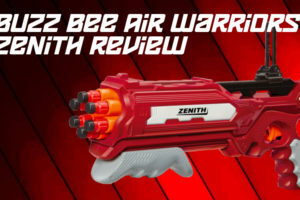 The Buzz Bee Zenith retails for around 13-16USD, and I’d assume that the Stryker Force would sell for the same price, or at least price bracket. This price range puts it directly in competition with the Elite Disruptor. Unfortunately for the Stryker Force, its toned down performance is a significant hindrance. 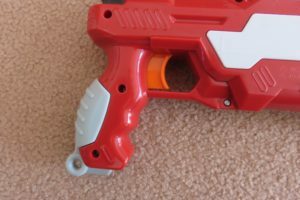 It not longer has any real advantages over other competing blasters such as the Disruptor. 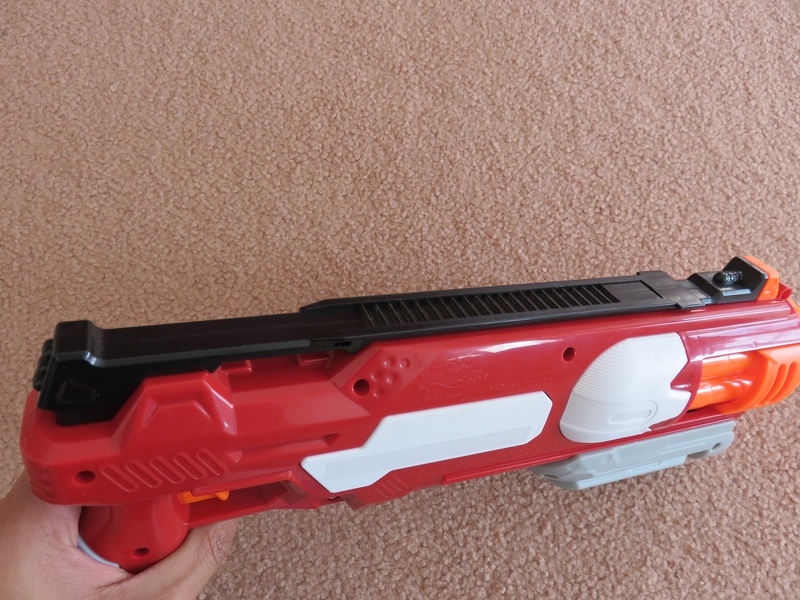 While it is by no means a bad blaster, it unfortunately simply does not have any notable feature as a stock blaster. 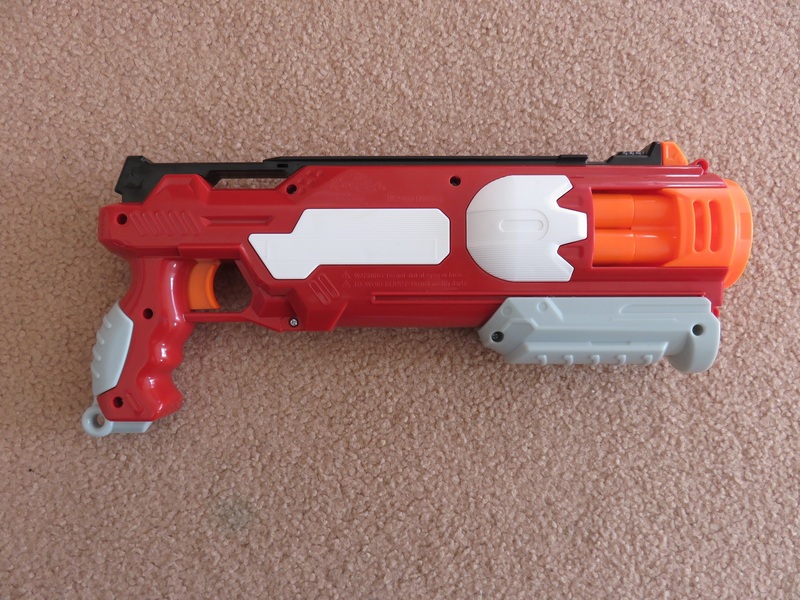 As such, I cannot give it a recommendation as a stock blaster. 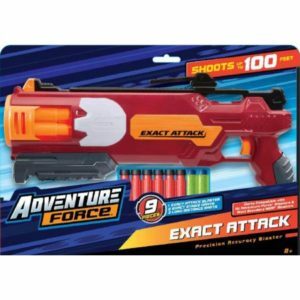 It is worth noting that the US-spec Zenith, or the Walmart exclusive Adventure Force Exact Attack (which appears to be a repack of a US-spec Stryker Force) are notably quite powerful, much like many of Buzz Bee’s other recent releases. The Stryker Force’s saving grace is its huge plunger tube. While in stock form it does not have a lot of power, the Zenith and Exact Attack prove that this platform has significant potential. 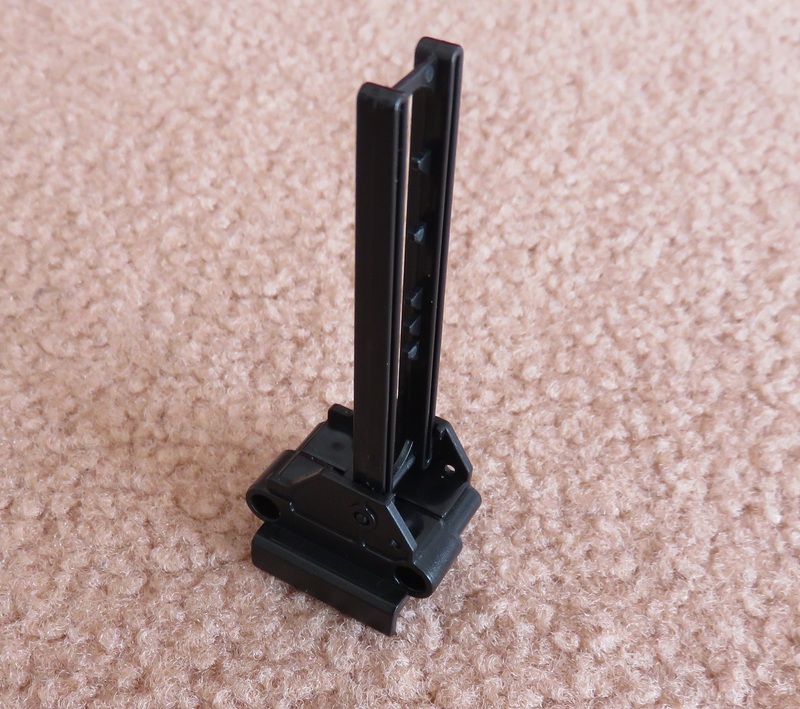 The sheer size of the plunger tube means that even a basic spring upgrade would give it a significant boost in power. With the right spring(s), I am sure it could easily match or exceed its competitors for raw power. 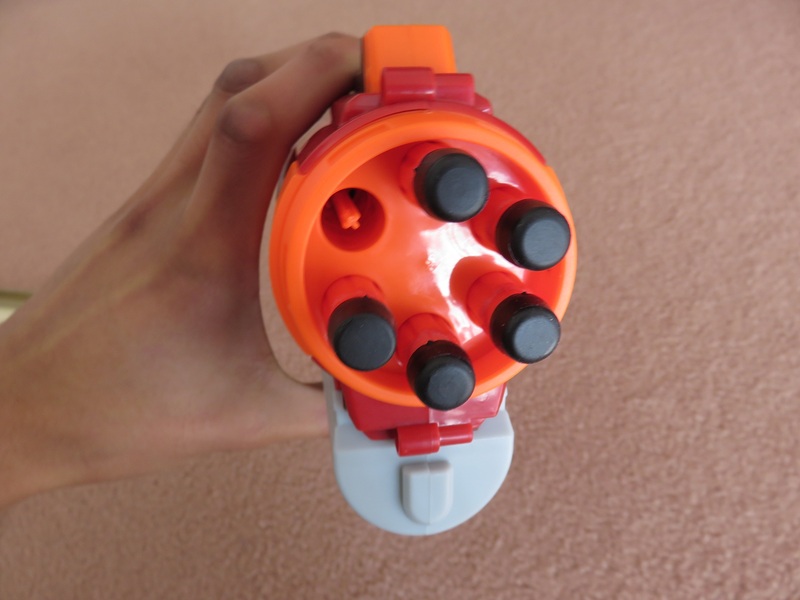 The firing mechanism is a little different to the usual system used for springer revolvers. 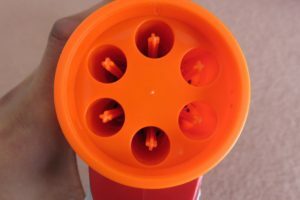 The plunger tube is open at both ends, with an outlet on top leading to the top barrel. 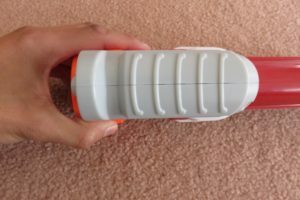 The priming rod attached to the pump grip pushes back directly on the floating plunger head. 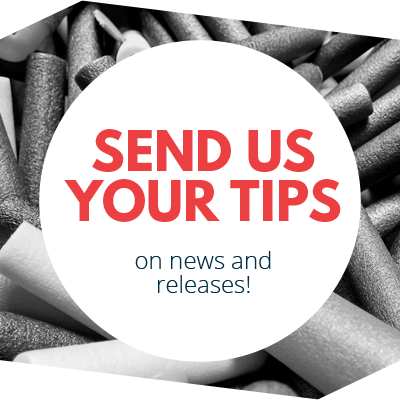 The priming rod itself also utilises an o-ring to seal against the plunger tube to prevent air loss. 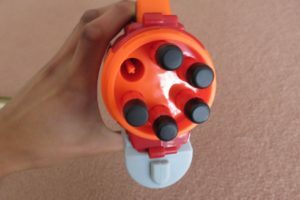 This design allows for minimum mass attached to the plunger head, as well as eliminating many of the weak points present in the plunger systems of other Buzz Bee blasters. 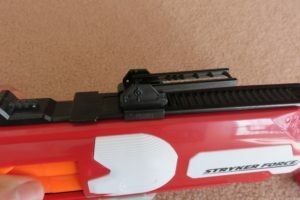 This entry was posted in Dart Blasters, Reviews and tagged 15m, australia, bee, buzz, buzz bee, force, review, stryker, zenith on August 13, 2017 by Outback Nerf. 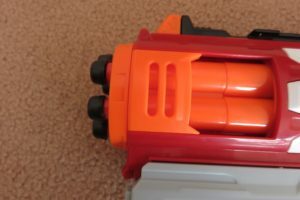 Nerf Game Report 5/8/17: Melbourne HvZ Nerf News: Alien Menace Melee Weapons listed on Toys R Us!